Compared to psychosocial programs implemented in post-conflict settings those executed in areas of ongoing conflicts may have different effects. Their evidence of efficacy has never been systematically reviewed. We searched PubMed, PsychInfo and the Dutch Tropical Institute Literature Portal from inception to31 January 2013 to identify studies on community-oriented psychosocial and psychiatric/clinical services for adults during ongoing man-made conflict or its direct aftermath. Of 6358 articles screened, 16 met our inclusion criteria. The interventions varied from psycho-educational to psychotropic drugs. The review is presented using outcome indicators such as PTSD, anxiety, depression, physical health, functioning and well being. A substantial improvement of some outcome was found though the small number of studies and their heterogeneity did not justify strong conclusions. PTSD symptoms improved significantly by treatments that included exposure (such as narrative exposure therapy). A number of studies (eight) showed notable improvement of the client’s functioning through counseling interventions. Depression and anxiety both improved considerably using that culturally adapted interventions (two studies), whereas non-culturalized interventions did not. We found a notable lack of studies on the efficacy of medication and on preferred western, evidence-based interventions for PTSD such Eye Movement Desensitization. To measure outcomes only two studies applied locally-developed diagnostic labels and validated instruments. Future research should encourage the use of robust research methods that are culturally valid, including mixed-methods research to combine measurable outputs with qualitative research aimed at improved understanding from the client’s perspective. Interventions to strengthen community and family support systems, often referred to as psychosocial programs, are reported to be effective in improving the mental health status of populations in humanitarian contexts  . However, the length of time since the conflict has passed affects the prevalence and type of mental health problems. In ongoing conflict areas, there is a greater risk to develop mental health and psychosocial problems than in post-conflict situations  . 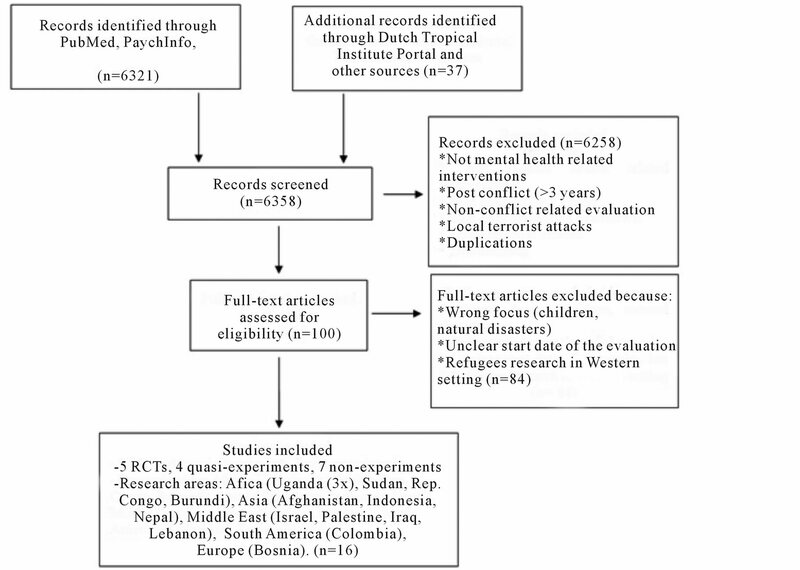 It has been suggested that daily stressors such as poverty, inadequate medical care, marginalization, and lack of basic resources such as food or shelter rather than war related experiences may explain a substantial part of the variance in mental health symptoms in contexts of ongoing violence  . A study done among Bosnian refugees undertaken more than three years after the conflict  found that despite an overall reduction of psychological problems, probably caused by the reduction of conflict and direct related daily stressors, serious mental health pathology persists or even develops for a specific group. We speculate that the effectiveness of typical psychosocial interventions such as counseling may differ because a different set of problems and symptoms is addressed in different stages of the conflict. A recent review summarized the evidence for mental health and psychosocial support in humanitarian settings  . However, the review made no distinction between conflict and post conflict interventions. We therefore sought to complement this review by conducting a systematic review of psychosocial and mental health interventions for adults in the context of ongoing, including 3 years after cessation of the hostilities, man-made violence. Three questions guided our literature search: 1) what was the focus of the psychosocial programs in areas of ongoing conflict? 2) what was the evidence of their benefits? and 3) what was the methodological quality of the research? 5) Posttraumatic Stress Disorder, Mental Health + Evaluation + Adults/Randomized Controlled Trial/RCT/ Controlled Study. From 2009 until 31 January 2013 the Dutch Tropical Institute Literature Portal provided us with selected literature updates on trauma and mental health identified through their search engines. We monitored relevant email literature alerts and requested information from colleagues. All Dutch, English, French and German language publications in peer-reviewed journals were screened. We included studies of community-oriented psychosocial or psychiatric and clinical services that aimed to improve beneficiary’s mental health or psychosocial status. We followed the Inter-Agency Standard Committee (IASC) definition of “mental health and psychosocial support” and thus included studies of “any type of local or outside support that aims to protect or promote psychosocial well-being and/or prevent or treat mental disorder” ( , p. 17). We excluded programmes focusing only on services such as nutrition and general education but not psychoeducation. We included Randomized Controlled Trials (RCTs), controlled trials (non-randomized but with a control group) and non-experimental studies (no randomization, no control group and only pre-post measurements). Included studies were conducted during ongoing man-made mass conflict or its direct aftermath, defined as not more than three years after cessation of hostilities. Single or multiple (but geographically confined) violent incidents (such as terrorists attacks) in high-resource countries were excluded. We also excluded studies focusing on children. Of the initial 6358 articles screened, 16 met our inclusion criteria (Figure 1). We found 5 Randomized Controlled Trails (Table 1), 4 controlled trials (Table 2), 7 non-experimental studies (Table 3). Twelve studies were conducted during ongoing conflicts, one was started during war and finished 3 years post-war  ; and three were undertaken during the post-conflict period but within the 3-year pre-specified period  - . Populations were IDPs or refugees living in non-camp settings (9) or IDP/refugee camps (5) or general community settings (2). Most studies focused on victims of general war-related violence. Two studies included specific types of violence such as torture and domestic violence   . Figure 1. Selection of outcome studies on mental health, psychosocial interventions in areas of ongoing violence. Figure shows different phases of the selection process, the number of articles included and major reasons for exclusion. Table 1. Brief description of randomized controlled trials meeting all inclusion criteria. For a detailed description see the supporting information. NET = Narrative Exposure Therapy, RCT = Randomized Control Trial, PTSD = Post Traumatic Stress Disorder, PI = Psychological Inoculation. Table 2. Brief description of controlled trials meeting all inclusion criteria. For a detailed description see the supporting information. PTSD = Post Traumatic Stress Disorder. Table 3. Brief description of non-experimental studies meeting all inclusion criteria. For a detailed description see the supporting information. 3) Nine studies included psychotherapeutic approaches such as narrative exposure therapy (NET,  ), cognitive behavior therapy (CBT), psychological inoculation  , healing/ reconciliation intervention  , a psychodynamic model based on Winnicott  , manualised local developed counseling based on Watzlawick  , Antonovsky  and manualised internet therapy  . All interventions except two (telephone  ; Internet  ) were conducted face to face. One intervention combined practical support (such as legal services provision) with the psychological intervention  and four studies included treatment with psychotropic drugs     . Most interventions were brief (2 - 6 sessions; 4-day workshop). In three studies    there were an average of 10 - 15 sessions; one study evaluated an intervention of weekly sessions over an average of 8.5 months  . In four studies treatment was provided by local mental health professionals    ; and in four studies by expatriate mental health professionals     . In seven studies treatment was provided by trained national (lay) counselors receiving clinical supervision from non-national or local mental health professionals. One study was unclear on the professional level of the counselors  . All studies used questionnaires to measure coping with trauma and posttraumatic symptoms. Questionnaires included the Posttraumatic Diagnostic Scale (PDS), the Post Traumatic Stress Disorder Checklist (PCL-C) and the Harvard Trauma Questionnaire (HTQ). Mooren et al. used the Impact of Event Scale (IES) to measure coping with trauma. Co-morbid disorders were assessed through checklists. The Self Reporting Questionnaire (SRQ 20), Hopkins Symptom Check List (HSCL 25) and anxiety/depression items of the Brief Psychiatric Rating Scale (BPRC) were used most frequently. Five studies      used the clinical interview as the Gold Standard. Three studies    applied standardized clinical interview instruments: the Composite International Diagnostic Interview  and the Mini-International Neuropsychiatric Interview  . Only four studies used questionnaires that had been validated for the local context: Neuner et al. (2008) used the PDS; Tol et al. used the PCL-C and the WHO Disability Assessment Scale (WHO-DAS). Two studies used locally designed and validated outcome measures   . Somatic health was used as an outcome measure in five studies, mostly by means of self-designed questionnaires    ; two studies   applied structured questionnaires (General Health Questionnaire, Symptom Checklist 90: somatic part). Ten studies were using functioning outcome measures           . All studies except three    used western-based instruments: the social/psychological functioning scale (SF 12, SF 36), the DSM IV Global Assessment of Functioning (GAF), the Subjective Well Being Scale-4 (SW-4), Mental Health Inventory, the Disability Assessment Scale (WHO DIS), and EUROHISQOL (European Health Indicator SystemQuality of Life). Three RCTs reported significant improvements of their clients using NET  and a reconciliation intervention without psycho-education  . The impact of trauma-focused counseling interventions differed substantially between studies. Neuner et al. found no benefit for supportive counseling (without exposure), neither did Tol et al.  . Brief trauma-focused therapy (10 - 15 sessions) provided moderate results for coping with trauma  . However, Neuner et al. reported significant results with flexible (intuition) trauma counseling (including exposure; for description see Table 1). Effect sizes merit careful examination as it is possible for interventions to produce significant improvements despite post-treatment symptoms remaining at pathological levels   . In three non-experimental studies, psychotherapy combined with medication and psychodynamic therapy (Winnicott model  ), or CBT based internet therapy, appeared to produce high improvement rates for PTSD  and complex PTSD  . One RCT applying a locally developed counseling approach (for description see Table 1) described significant improvement of both anxiety and depression. Sonderegger et al. using a group culturalized CBT intervention reported significant improvement on locally defined and validated depression and anxiety syndromes. None of the other interventions (NET, non-specific problem-solving group counseling, reconciliation, psycho-education, combined problem solving and stress-reduction counseling) gave statistically significant reductions in anxiety or depression symptoms. In three non-experimental studies, high improvement rates were found for depression and anxiety using psychotherapy (including psychodynamic interventions), problem-solving counseling and/or medication, and manualised internet therapy    . A reconciliation intervention  did not lead to significant improvement of somatic symptoms. NET, flexible trauma counseling and non-specific problem-solving group counseling resulted in non-significant  or small improvement  . Tol et al. showed a moderate benefit using problem-solving and stress-reduction counseling. Mooren et al. found general health improved with brief trauma-focused therapy. NET  , psychological inoculation and emotional ventilation  did not result in significantly changed functioning or well being. However, locally developed counseling methods based on problem solving approaches and positive psychology  as well as culturally-adapted CBT  did report significant improvement of psychosocial stressors, coping skills, pro-social behavior, disability and functioning. Western problem-solving and stress-reduction counseling combined with minimum medical services, legal assistance and if necessary psychotropic drugs  showed similar improvements. Bass et al. reported some functionality improvements with non-specific problem group counseling. In non-experimental studies substantial increase of functioning was reported   . Souza et al. report decreased disability of clients and improved functioning after visiting a primary (mental) health care clinic. A qualitative study of a long-term (8.5 months) group intervention helping women to improve their (functioning) skills and social networks, reported a substantial increase in social (communication) skills  . Nearly one third of the studies applied the RCT methodology. One RCT, on the effectiveness of psychological inoculation  , was difficult to evaluate because population samples and outcome measures (and their reliability scores) were not described. Four studies had a non-randomized, controlled design with large sample sizes. There was one qualitative study. The remaining six studies were observational studies. Studies varied substantially with regard to participants, outcome measures, time since the potentially traumatic experience, treatment standardization, outcome measure, control groups, treatment length and seriousness of disorder. Two studies applied locally constructed and validated outcome measures only, and another two studies validated measures locally, but did not construct them locally   ; the remaining twelve studies did not construct nor validate their outcome measures locally. A previous review evaluated psychosocial program outcomes unrelated to the stage of the conflict. We speculated that the effectiveness of typical psychosocial interventions such as counseling might differ because different set of problems and symptoms have to be addressed in different stages of the conflict. We aimed to complement the existing meta-analysis  with a review focused on (adult) studies of psychosocial interventions in the context of ongoing man-made violence. Our review of research on adults in areas of ongoing violence did not reveal major difference between areas of violence and post-conflict settings  . Effective interventions for PTSD showed, in accordance to research conducted in western countries  , the importance of exposure. Exposure techniques within PTSD interventions, such as NET (a variant of Cognitive Behavior Therapy), were carried out according to strict protocols. Additionally, we found that less structured exposure methods such as relating the client’s current problem to a past traumatic experience (flexible counseling,  ) or encouraging to share war experiences (reconciliation intervention  ) also provided substantial treatment results. We did not find evidence for the suggestion that strict manualization  enhances the effect of PTSD-focused interventions. The efficacy of different PTSD treatments is not surprising. A meta-analysis of studies comparing different PTSD treatments  concluded they were equally beneficial for PTSD patients. As with the previous review  the heterogeneity of the PTSD studies hindered us to do a comparison analysis. An essential concern is the clinical implication of these outcomes. Statistically significant differences between pre-, post-treatment and follow-up indicated clear improvement. However, two studies reported statistically significant improvement but post-measurement scores still indicated pathology  . Similar to a previous review  we found that counseling approaches focused on PTSD did not have an effect on anxiety or depression co-morbidity (for instance    ); probably, because they focused on PTSD and did not intend to treat co-morbidity  . We further found conflicting evidence for the impact of interventions on anxiety, depression, and physical symptoms. All interventions based on western counseling models that were not culturally adapted failed to establish an impact on anxiety or depression or somatic health (except  ). However, an RCT conducted in Afghanistan  applying a culturally sensitive counseling approach that drew on personal problem solving resources established significant improvements on anxiety and depression as well as improvement of coping skills and a reduction of locally defined psychosocial stressors. Another study conducted in Uganda using culturallyadapted CBT intervention  reported significant improvement on locally defined anxiety and depressive syndromes in a controlled trial. These challenging outcomes might be explained by the lack of cultural adaptation of the intervention. The two interventions   using locally developed intervention strategies reported substantial improvement on anxiety, depression, psychosocial stressors, coping skills and social functioning. However, another culturally adapted non-specific problem-solving counseling approach was reported to improve only coping skills and not anxiety or depression  . Maybe Bass et al. were less successful in harmonizing the counseling approach with the explanatory model of the client’s beliefs about causes of illness, assumptions about the time line, perceived consequences and what is acceptable as treatment   . In a meta-analysis comparing outcomes of culturally-adapted and regular proven psychotherapies Benish et al. concluded that differences in treatment outcome were related to successful adaptation of the intervention to the “client’s illness myth”. Thus for cultural adaptation not the changes in treatment elements are important but the adaptation of the therapist to the client’s model of illness. Both Ayoughi et al. and Sonderegger et al. may have been more successful in this regard. Further research to clarify the impact of counseling on specific disorders such as anxiety and depression is needed. In evaluating the client’s changes in functioning, one RCT and most controlled studies reported significant improvement for interventions such as problem solving counseling  , group culturally-adapted CBT  and problem and stress-reduction counseling  . No functional improvement was found for NET. The efficacy of these counseling interventions supports the proposition that in acute emergencies psychosocial programs should focus on the restoration of functioning  and the need for “minimum responses in the midst of emergencies” ( , p. 17). The next step needed is to confirm these findings through RCTs using locally validated concepts of functioning. We found one study, with a non-experimental design, on the efficacy of medication. It showed significant effects on symptom improvement  . However, Ayoughi et al. found counseling significantly more effective when comparing counseling with medication only. The lack of studies on medication seems sensible as in unstable settings the priority is the improvement of access and adherence to medication. To lower risks of medication rupture and increase adherence, lessons can be learnt from other fields such as HIV/AIDS care  The imperative to prioritize delivery of medicines does not mean research on efficacy of medication should be neglected though. We found a notable lack of studies on the preferred western, evidence-based interventions for PTSD such as CBT and Eye Movement Desensitization Reprocessing (EMDR). This disconnection between research and practice was also a major finding of Tol et al.  . Mental health and psychosocial interventions in areas of ongoing violence should bridge the gap quickly. They can build on systematic reviews suggesting the effectiveness of western, evidence-based interventions in non-western populations living in the west, provided they are harmonized with the “client’s illness myth” as suggested   . The reported studies varied substantially with regard to participants, outcome measures, time since the potentially traumatic experience, treatment standardization, outcome measure, control groups, treatment length and seriousness of disorder. This variation limits the generalization of conclusions. The lack of cross cultural validity has been a major limitation in most studies. Our review showed that not validated western self-reporting questionnaires have been used in areas of ongoing conflict mostly (12 studies). These instruments have several constraints, including their length, lack of cultural validity and reference to western mental health concepts. Also, their complexity may have hindered their application and their use by clients with low levels of formal education. Two studies validated used western instrument with outcome measures validated locally, but did not construct them locally   . Only two studies (  , both controlled but non-randomized) used locally developed diagnostic labels and validated instruments for needs assessment and outcome evaluation. These studies showed the important differences in illness concepts and symptom clustering between western and non-western cultures. The key challenge for research into the effectiveness of psychosocial interventions in areas of ongoing violence did not differ substantially from those in other humanitarian settings  . Locally developed criteria and instruments have clear validity advantages but also shortcomings as their incomparability with other settings, is at least problematic. Some suggest this can be moderated by using the same protocols for different cultural settings and compare outcomes  . Furthermore, the clinical relevance is uncertain as the comparison of these instruments to an established clinical interview gold standard has been problematic. Unfortunately, the current frequently used Gold Standard to validate western instruments in non/western countries, such as the World Health Organization’s Composite International Diagnostic  , also had substantial cross-cultural validity limitations  . The application of these instruments to validate western-designed instruments in non-western settings (for instance   ) should be a point of further scientific discussion. The lack of cross cultural validated gold standard instruments illustrates the complexity of conducting outcome research in non-western areas of ongoing violence. The development of a gold standard should be a key priority in psychosocial intervention research. Lastly, most of the non-experimental research was carried out by non-governmental organizations (NGOs). We question whether this is acceptable as strengthening of standard program monitoring may provide better information than non-experimental studies. The American Psychological Association Division 12 is clear on their requirement for efficacious treatments: “only RCTs and their logical equivalents afford strong causal inferences”  . We agree with this statement but question the inflexibility of this requirement for all contexts. Such high standards may discourage research in conflict areas. The fast-changing and unpredictable circumstances of conflict settings may jeopardize outcomes. In Neuner et al. over 80% of participants were lost to follow-up due to improved security conditions. Setting the RCT as a benchmark for evidence may push outcome research into the use of highly disputed (for instance  ) western, medical Diagnostic System Manualcriteria  such as PTSD, anxiety and depression. This fear is realistic. Despite practical, time limited, scientific methods to create and validate locally developed criteria to identify important mental health issues  these methods have hardly been used in humanitarian settings. RCT research models have methodological limitations too. Their use in outcome research gives insight about effects but leaves unaddressed the impact of important humanitarian motives such as compassion, empathy and a sense of justice  . Finally, in general the quality of most RCT studies is low. In two reviews of all RCTs available on PubMed it was concluded that the overall quality of RCT reporting remains below an acceptable level   . Our review shows similar shortcomings in the RCTs we identified: poor study description (for instance  ), lack of validation (for instance  ) and small sample sizes (for instance    ). The importance of aiming for the highest quality scientific evidence is undisputed. However, it is questionable whether these standards are currently possible or necessary in areas of ongoing violence. In addition, the alternative of controlled (but non-randomized) study design gives insight to the daily clinical realities of our clients, which is often lacking in RCTs  . We identified one qualitative study only. The lack of qualitative research leaves unanswered important questions such as what beneficiaries expect from an intervention. Other valuable domains of outcome research such as changes in skills (for instance communication), attitudes (for instance openness), relationships (for instance within the family), connectedness to community and functioning have not been not explored  . Mixed-methods research capitalizes on the strengths of both qualitative and quantitative research methods and is recommended as practical and informative in this area  . Our review showed that the inclusion of beneficiary perspectives was limited. Future research projects should aim to include the local perspectives of recipients from start to evaluation to better understand whether the intervention is effective for them. This is in line with accepted research priorities  . Ongoing input of practitioners and beneficiaries in the design, execution and re-definition of the research protocol is vital if the clients’ explanatory models are to be included. Joint ventures of local practitioners and universities with western-based academia have proven effective in this area (for instance   ). We included only published studies and did not include grey literature publications. The limited number of studies (5 RCTs, 4 controlled trials) do not allow for strong conclusions. Different socio-cultural and health system environments in which these interventions were implemented might have contributed to heterogeneity in results. This has an effect on the generalizability of the conclusions. Likewise, differences in pre-morbid severity of symptoms, symptom duration, and the length of time since trauma exposure may also have influenced outcomes. The reporting these variables was not consistent. For this reason we were unable to include in them in our review. The small number of studies (16) identified in this review and their high heterogeneity does not justify strong conclusions. For different humanitarian contexts, conflict and post-conflict, we did not find important differences in treatment outcomes. In concord with a previous review  we found evidence for the effectiveness of psychosocial, mental health interventions focusing on PTSD symptoms in areas of ongoing violence. Especially, NET which was considered part of CBT interventions proved to be effective. We also found that various methods of counseling enhanced the client’s functioning  . In areas of ongoing violence improved functioning may be essential for the survival of individuals and groups. Trained, clinically supervised, lay counselors implemented most of the reviewed interventions. Their effectiveness is reassuring for the implementation of services in crisis areas in which often qualified, well trained staff is in shortage. Our review showed the importance of culturally adapted counseling interventions. Non-culturally adapted counseling approaches did not affect anxiety and depression symptoms; those that were culturally adapted did have a significant effect on these symptoms next to the effects on posttraumatic symptoms. Future trials should include multimodal intervention combining both trauma-focused therapies such as NET (for PTSD) and counseling /problem solving techniques (for anxiety-depression/functionality) given the fact that co-morbidity of mental disturbances and functional impairment often go together. The knowledge based on psychosocial interventions adapted to the client’s (cultural) illness model evaluated with locally-developed and culturally-validated concepts and instruments must increase. The development of a cross cultural validated gold standard is the most important challenge. RCT methodologies and comparative evaluations should be encouraged for the assessment of future interventions, incorporating mixed-methods approaches to integrate qualitative evaluations. Establishing what works is important, but continuous input of practitioners and beneficiaries is the only way to start understanding why they work. Sarah Venis for editing the manuscript. Tol, W.A., Barbui, C., Galappatti, A., Silove, D., Betancourt, T.S., Souza, R.O., Golaz, A. and Van Ommeren, M. (2011) Mental Health and Psychosocial Support in Humanitarian Settings: Linking Practice and Research. The Lancet, 378, 1581-1591. Inter-Agency Standing Committee (2007) IASC Guidelines on Mental Health and Psychosocial Support in Emergency Settings. Inter-Agency Standing Committee, Geneva. Mooren, T.T.M., De Jong, K., Kleber, R.J., Kulenovic, S. and Ruvic, J. (2003) The Impact of a Mental Health Program in Bosnia-Herzegovina: Effects on Coping and General Health. Journal of Clinical Psychology, 59, 1-28. Bass, J., Poudyal, B., Tol, W., Murray, L., Nadison, M. andBolton, P. (2011) A Controlled Trial of Problem-Solving Counseling for War-Affected Adults in Aceh, Indonesia. Social Psychiatry and Psychiatric Epidemiology, 47, 279- 291. Yeomans, P.D., Forman, E.M., Herbert, J.D. and Yuen, E. (2010) A Randomized Trial of a Reconciliation Workshop with and without PTSD Psychoeducation in Burundian Sample. Journal of Traumatic Stress, 23, 305-312. Manneschmidt, S. and Griese, K. (2009) Evaluating Psychosocial Group Counselling with Afghan Women: Is This a Useful Intervention? Torture: Quarterly Journal on Rehabilitation of Torture Victims and Prevention of Torture, 19, 41. Mooren, T.T.M., De Jong, K., Kleber, R.J., Kulenovic, S. and Ruvic, J. (2003) The Evaluation of Mental Health Services in War: A Case Register in Bosnia-Herzegovina. Intervention, The International Journal of Mental Health, Psychosocial Work and Counselling in Areas of Armed Conflict, 1, 57-67. Neuner, F., Schauer, M., Klaschik, C., Karunakara, U. and Elbert, T. (2004) A Comparison of Narrative Exposure Therapy, Supportive Counseling, and Psychoeducation for Treating Posttraumatic Stress Disorder in an African Refugee Settlement. Journal of Consulting and Clinical Psychology, 72, 587-579. Souza, R., Yasuda, S. and Cristofani, S. (2009) Mental Health Treatment Outcomes in a Humanitarian Emergency: A Pilot Model for the Integration of Mental Health into Primary Care in Habilla, Darfur. International Journal of Mental Health Systems, 3, 17. Hustache, S., Moro, M.R., Roptin, J., Souza, R., Gansou, G.M., Mbemba, A., Roederer, T., Grais, R.F., Gaboulaud, V. and Baubet, T. (2009) International Journal of Mental Health Systems. International Journal of Mental Health Systems, 3, 7. Winnicott, D. W. (1960) The Maturational Process and the Facilitating Environment: Studies in the Theory of Emotional Development. International UP Inc., New York, 140-152. Watzlawick, P., Weakland, J.H. and Fisch, R. (1974) Change: Principles of Problem Formation and Problem Resolution. Norton, New York. Antonovsky, A. (1987) Unraveling The Mystery of Health—How People Manage Stress and Stay Well. Jossey-Bass Publishers, San Francisco. Ayoughi, S., Missmahl, I., Weierstall, R. and Elbert, T. (2012) Provision of Mental Health Services in Resource Poor Settings: A Randomised Trial Comparing Counselling with Routine Medical Treatment in North Afghanistan (Mazar-e-Sharif). BMC Psychiatry, 12, 14. Sheehan, D.V., Lecrubier, Y., Sheehan, K.H., Amorim, P., Janavs, J., Weiller, E., Hergueta, T., Baker, R. and Dunbar, G.C. (1998) The Mini-International Neuropsychiatric Interview (M.I.N.I. ): The Development and Validation of a Structured Diagnostic Psychiatric Interview for DSM-IV and ICD-10. Journal Clinical Psychiatry, 59, 22-33. Benish, S.G., Quintana, S. and Wampold, B. (2011) Culturally Adapted Psychotherapy and the Legitimacy of Myth: A Direct-Comparison Meta-Analysis. Journal of Consulting and Clinical Psychology Consulting and Clinical Psychology, 58, 279-289. Frank, J.D. and Frank, J.B. (1993) Persuasion and Healing: A Comparative Study of Psychotherapy. The Johns Hopkins University Press, Baltimore and London. De Jong, K., Kleber, R.J. and Puratic, V. (2003) Mental Health Programs in Areas of Armed Conflict: The Médecins Sans Frontières Counselling Centres in Bosnia-Hercegovina. Intervention, 1, 14-32. Tol, W.A., Rees, S.J. and Silove, D.M. (2013) Broadening the Scope of Epidemiology in Conflictaffected Settings: Opportunities for Mental Health Prevention and Promotion. Epidemiology and Psychiatric Sciences, 22, 1-7. A. P. Association and A. P. A. T. F. on DSM-IV. (2000) Diagnostic and Statistical Manual of Mental Disorders: DSM-IV-TR. American Psychiatric Publishing, Inc., Washington, DC. Hopewell, S., Dutton, S., Yu, L.M., Chan, A.W. and Altman, D.G. (2010) The Quality of Reports of Randomised Trials in 2000 and 2006: Comparative Study of Articles Indexed in PubMed. BMJ: British Medical Journal, 340, c723. Relton, C., Torgerson, D., Cathain, A. and Nicholl, J. (2010) Rethinking Pragmatic Randomised Controlled Trials: Introducing the Cohort Multiple Randomised Controlled Trial Design. BMJ: British Medical Journal, 340, c1066. Psychosocial Working Group (2003) Psychosocial Intervention in Complex Emergencies: A Conceptual Framework. Psychosocial Working Group, Edinburgh.